Graham is a full-time professional artist born in North East Essex and is an elected member of The Royal Institute of Oil Painters and the Institute of East Anglian Artists. His love of oil paint stems from the adaptability and responsiveness of the medium while many contemporary artists and friends provide encouragement, East Anglian painters such as Edward Seago, Harry Becker and John Constable are sources of constant inspiration. Most of Graham's paintings are influenced by the appreciation of nature and the landscape itself whether at home in East Anglia or further afield. "An hour or two in front of the subject will give you a story so long and varied that it is impossible to include everything you experience. What drives me to paint is the pursuit of interpreting the highlights of that story into a meaningful piece of work". Exhibiting regularly around the UK, Graham's work has also been shown at the annual exhibitions of The Royal Institute of Oil Painters, The Royal Society of Marine Artists and The Royal Society of British Artists at the Mall Galleries, London. Graham has received several awards for his painting. In 2012 Graham's work was selected as part of the Lynn Painter-Stainers Prize Exhibition, touring the Mall Galleries and WH Patterson, London. The same year, Graham received the Menena Joy Schwabe Memorial Award for an outstanding oil painter at the Royal Institute of Oil Painters annual exhibition. He was also the winner of the Daler-Rowney Prize, IEA Committee's Choice for a group of paintings shown at the Institute of East Anglian Artists annual exhibition and was selected for the Frank Herring Award at the Royal Institute of Oil Painters exhibition in 2014. Graham was commissioned to write oil painting and drawing chapters in a book entitled 'Artists Painting Techniques' published by Dorling Kindersley and was the consultant artist for 'Artists Drawing Techniques' by the same publishers. He writes articles regularly for the Artist Magazine, has been featured in Artists and Illustrators Magazine and is listed in 'Who's Who in Art'.. Graham's paintings have also been used on the set for the BBC. 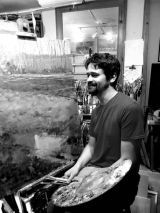 He is available to give painting demonstrations to art groups and societies, if you would like more information, please use the contact page. Graham's paintings are collected throughout the UK, Europe and the USA and is also held in the Albert Sloman Library's (University of Essex) permanent collection. More on how Graham approaches his work can be found here. If you are an Art Society or Group and are interested in more information about Graham's demonstrations please click here.